This study has been undertaken to investigate the status of Capital as per Basel II in four sample commercial banks operating in Bangladesh. The study was conducted by taking capital managing system shown in the annual report 2007 to 2010 of selected four banks & Basel II agreement. The research has found that the selected four banks maintain their minimum capital adequacy ratio (CAR) as per Basel II according to Bangladesh bank guidelines 10% of the CAR. In the year of 2007 MTBL and CBL has surplus capita while UCBL, FSIBL was deficit of capital. In year of 2008 the four selected banks under surplus capital. In the year of 2009 FSIBL and CBL was under surplus of capital. And finally, 2010 only MTBL was surplus of capital and other three banks was deficit of capital position. Finally, it has some recommendation to implement the Basel II effectible in Bangladesh banking sector. Banking sector is very important for any country in the world. For the inflation banking sector are specially effected. For this reason, bank need to maintain their capital in such way that will reduce risk. The Basel Committee was established as the Committee on Banking Regulations and Supervisory Practices by the central-bank Governors of the Group of Ten countries at the end of 1974 in the aftermath of serious disturbances in international currency and banking markets. The first meeting took place in February 1975 and meetings have been held regularly three or four times a year since. The Committee’s members come from Argentina, Australia, Belgium, Brazil, Canada, China, France, Germany, Hong Kong SAR, India, Indonesia, Italy, Japan, Korea, Luxembourg, Mexico, the Netherlands, Russia, Saudi Arabia, Singapore, South Africa, Spain, Sweden, Switzerland, Turkey, the United Kingdom and the United States. The Basel Committee on Banking Supervision provides a forum for regular cooperation on banking supervisory matters. Its objective is to enhance understanding of key supervisory issues and improve the quality of banking supervision worldwide. In this regard, the Committee is best known for its international standards on capital adequacy; the Core Principles for Effective Banking Supervision; and the Concordat on cross-border banking supervision. The New Accord has defined a structured framework comprising three pillars such as Pillar I, II and III. Pillar I sets out minimum capital requirements. Pillar II defines the process of supervisory review of a financial institution’s risk management framework. Pillar III determines market discipline through improved disclosure. From the above discussion the study issue has been taken to analysis the capital adequacy ratio of four commercial banks. To present the theoretical background of Basel I, Basel II and Basel III. To analysis the CAR of four commercial banks for the period of 2007, 2008, 2009 and 2010. To compare the CAR of four commercial banks. In this study the following sources of data and methods are used. A number of relevant books, journals. Annual report of selected banks. The study has used the Basel guideline prepared by Bangladesh Bank which has been moduled as per main regulations of Basel II give by the Basel Committee of Banking supervision (BCBS). The objectives of the study may have less meaning for the following reasons. Scheduled banks are fully implementing the 1st pillar that is Minimum Capital Requirements. But the other 2nd and 3rd pillars are yet to implement. Data regarding supervisory Review Process and Market Discipline were not available. Access to every required source was limited for confidential issues. The study was limited to four banks only. Since the revised framework has been designed to provide for banks and banking system world, the Basel committee on banking supervision (BCBS) acknowledges that moving towards its adoption in the near future may not be the first priority for all supervisory authorities in terms of what is needed to strengthen their supervision. Each national supervisor is expected to consider carefully the benefits of the revised Framework in the context of its domestic banking system banking system when developing a timetable and approach for implementation. It is believed that such an international standard can help protect the international finance system from the types of problems that might arise should a major bank or a series of bank collapse. In practice, Basel II attempt to accomplish this by setting up rigorous risk and capital management requirement designed its lending and investment practices. In simple terms, the greater risk to which the bank is exposed, the greater the amount of capital the bank needs to hold to safeguard its solvency and overall economic stability. (Malvaniya, 2010). The views of the Executive Board of the international Monetary und clearly indicate that premature adoption of Basel II in countries with limited capacity could inappropriately divert resources from the more urgent priorities, ultimately weakening rather than strengthening their financial system comprising institutions, markets and infrastructure and focus n achieving greater level of compliance with the Basel core principles. Against this background, the IM has cautioned that Fund staff should avoid conveying the perception that countries will be criticized for not moving to adopt the Basel II framework. They have urged staff to be completely candid when asked to assess countries readiness to move to Basel II and to indicate clearly the risks of moving too quickly and too ambitiously. (Dr. Y. V. Reddy, 2006) The proposed implementation of Basel II accord for Bangladesh bank, with the objective of promoting stronger risk management practice, presents a serious challenge in terms of skill. The development of such systems in the local industry requires both intensive training as well as behavioral and attitude change. (Mainuddin, 2008). The view of the above, this study is concerned to explore the capital adequacy ratio of some commercial banks of Bangladesh and to find out some problems as the bankers faces in Basel implementation. Supervisory Practices by the central-bank Governors of the Group of Ten countries at the end of 1974 in the aftermath of serious disturbances in international currency and banking markets. The first meeting took place in February 1975 and meetings have been held regularly three or four times a year since. The Committee’s members come from Belgium, Canada, France, Germany, Italy, Japan, Luxembourg, the Netherlands, Spain, Sweden, Switzerland, United Kingdom and United States. Countries are represented by their central bank and also by the authority with formal responsibility for the prudential supervision of banking business where this is not the central bank. The present Chairman of the Committee is Mr. William J. McDonough, President and Chief Executive Officer of the Federal Reserve Bank of New York. In 1988, the Committee decided to introduce a capital measurement system commonly referred to as the Basel Capital Accord. This system provided for the implementation of a credit risk measurement framework with a minimum capital standard of 8% by end-1992. Since 1988, this framework has been progressively introduced not only in member countries but also in virtually all other countries with internationally active banks. In June 1999, the Committee issued a proposal for a revised Capital Adequacy Framework. The proposed capital framework consists of three pillars: minimum capital requirements, which seek to refine the standardised rules set forth in the 1988 Accord; supervisory review of an institution’s internal assessment process and capital adequacy; and effective use of disclosure to strengthen market discipline as a complement to supervisory efforts. Following extensive interaction with banks, industry groups and supervisory authorities that are not members of the Committee, the revised framework was issued on 26 June 2004. This text serves as a basis for national rule-making and for banks to complete their preparations for the new framework’s implementation. In Pillar I, three kinds of risk such as credit risk, market risk and operational risk are considered to determine the minimum capital requirement. The definition of eligible regulatory capital remains the same as outlined in the 1988 Accord i.e., the ratio of capital to risk-weighted asset remains unchanged at 8%. Pillar II ensures that not only do banks have adequate capital to cover their risks, but also that they employ better risk management practices so as to minimize the risks. Supervisors will be expected to evaluate the board and management of banks, to look into strategic decisions and to evaluate portfolio diversification as well as the ability to react to future risks in a rapidly changing environment. In particular, issues of transparency, corporate governance and efficient markets can be considered as additional challenges in pillar II enforcement. Banking operations are becoming complex and difficult for supervisors to monitor and control. In this context, Basel Committee has recognized the importance of market discipline and has suggested implementing it by asking banks to make adequate disclosures. The potential audiences of these disclosures are supervisors, bank’s customers, rating agencies, depositors and investors. With frequent and material disclosures, outsiders can learn about the bank’s risks. These guidelines are issued by Bangladesh Bank (BB) under section 13 and section 45 of Bank Company Act 1991. BB has introduced these guidelines considering present complexity and diversity in the banking industry and to make the banks’ capital more risk sensitive and shock absorbent. BB has made these guidelines as statutory compliance for all scheduled banks in Bangladesh from January 01, 2010. These guidelines have been prepared in accordance with “International Convergence of Capital Measurement and Capital Standards: A Revised Framework” of June, 2006 (popularly known as ‘Basel II Capital Adequacy Framework’) released by Basel Committee on Banking Supervision (BCBS). These guidelines will be called as ‘Guidelines on Risk Based Capital Adequacy (RBCA) for Banks’. Minimum capital requirements to be maintained by a bank against credit, market and operational risks. Process for assessing the overall capital adequacy aligned with risk profile of a bank and capital growth plan accordingly. Framework of public disclosure on the position of bank’s risk profiles, capital adequacy and risk management system. -‘Consolidated Basis’ refers to all position of the bank (including its local and overseas branches/offices) and its subsidiary company(ies) engaged in financial (excluding insurance) activities like merchant banks, brokerage firms, discount houses, etc (if any). Regulatory capital will be categorized into three tiers: Tier-1, Tier-2, and Tier-3. 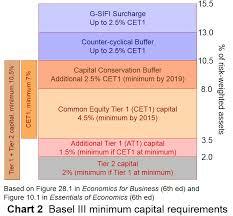 Tier 3 capital, called ‘Additional Supplementary Capital’, consists of short-term subordinated debt (original maturity less than or equal to five years but greater than or equal to two years) would be solely for the purpose of meeting a proportion of the capital requirements for market risk. e) Borrowing from head office in foreign currency in compliance with the regulatory requirement as specified in Subordinated Debt. d) Subordinated debt shall be limited to a maximum of 30% of the amount of Tier 1.
e) A minimum of about 28.5% of market risk needs to be supported by Tier 1 capital. Supporting of Market Risk from Tier 3 capital shall be limited up to maximum of 250% of a bank’s Tier 1 capital that is available after meeting credit risk capital requirement. f) Any investment exceeding the approved limit under section 26(2) of, Bank Company Act 1991. The additional amount of investment will be deducted at 50% from Tier 1 capital and 50% from Tier 2 capital. g) Investments in subsidiaries which are not consolidated. The normal practice will be to consolidate subsidiaries for the purpose of assessing the capital adequacy of banking groups. Where this is not done, deduction is essential to prevent the multiple uses of the same capital resources in different parts of the group. The deduction for such investments will be 50% from Tier 1 capital and 50% from Tier 2 capital. The assets representing the investments in subsidiary companies whose capital had been deducted from that of the parent would not be included in total assets for the purposes of computing the CAR. Eligible Tier 2 capital will be derived after deducting components if any qualified for deduction. Total eligible regulatory capital will be calculated by summing up the eligible Tier 1, Tier 2 and Tier 3 capital. In order to calculate CAR, banks are required to calculate their Risk Weighted Assets (RWA) in respect of credit, market, and operational risks. Total RWA will be determined by multiplying capital charge for market risk and operational risk by the reciprocal of the minimum CAR and adding the resulting figures to the sum of risk weighted assets for credit risk. The CAR is then calculated by taking eligible regulatory capital as numerator and total RWA as denominator. a) No Scheduled Bank in Bangladesh shall commence and carry on its business unless it has the minimum required capital as per section 13 of Bank Company Act 1991.
b) Banks have to maintain CAR on ‘Solo’ basis as well as on ‘Consolidated’ basis as per instruction(s) given by BB from time to time. c) Banks shall also maintain a minimum Capital Adequacy Ratio (CAR) of at least 10% of Risk Weighted Assets (RWA) with core capital (Tier-1) not less than 5% of RWA*. CAR would be derived dividing total Eligible Regulatory Capital by RWA and multiplied by 100. Total Risk Weighted Assets (RWA) will be determined by multiplying capital charge for market risk and operational risk by a factor of 10 (i.e., the reciprocal of the minimum capital adequacy ratio of 10%) and adding the resulting figures to the sum of risk weighted assets for credit risk. The rules text presents the details of the Basel III Framework, which covers both micro prudential and macro prudential elements. The Framework sets out higher and better-quality capital, better risk coverage, the introduction of a leverage ratio as a backstop to the risk-based requirement, measures to promote the buildup of capital that can be drawn down in periods of stress, and the introduction of two global liquidity standards. of 2017 with a view to migrating to a Pillar 1 treatment on 1 January 2018 based on appropriate review and calibration. As per directives of the Bangladesh Bank, every schedule commercial banks in Bangladesh have to submit a Risk Based Capital Adequacy Statement on a quarterly basis according to RBCA guideline. In this statement, banks have to focus mainly on the Eligible Capital, Minimum Capital Requirement and Capital Adequacy Ratio of the bank. The below portion of this report will going to measure the CAR of a renowned bank of Bangladesh based on the original data and information. The Capital Structure of United commercial Bank Limited, First Security Islami Bank Limited, Mutual Trust Bank Limited & City Bank Limited consists of Tier1 and Tier2 capital. Tier1 capital of the bank includes Paid-up capital, Non-repayable share premium account, statuary reserve, General reserve, Retain earnings, Minority interest in subsidiary, Non-cumulative irredeemable preference share and Dividend equalization fund. Tier1 capital also called “Core Capital” of the banks. Tier2 capital consist of general provision, revaluation reserves for fixed assets, security and equity instruments, all other preference shares and Subordinated bond. Table: 5 Tier1 capitals of selected Banks CAR. According to Bangladesh Bank guidelines all commercial banks are required to maintain their Tier1 capital minimum 5% of RWA. All banks maintain their Tier1 capital above 5%. In 2007 CBL Tier1 capital proportion was the highest at 9.24% and the FSIBL Tier1 capital proportion is the lowest at 7.77%. Whereas, UCBL, MTBL Tier1 were 7.82% & 8.28%. In 2008 FSIBL Tier1 capital proportion was the highest at 14.63% and the CBL Tier1 capital proportion was the lowest at 7.55%. Whereas, UCBL, MTBL Tier1 were 8.44% & 8.92%. In 2009 FSIBL Tier1 capital proportion was the highest at 9.20% and the CBL Tier1 capital proportion was the lowest at 7.27%. Whereas, Whereas, UCBL, MTBL Tier1 were 7.39% & 7.65%. 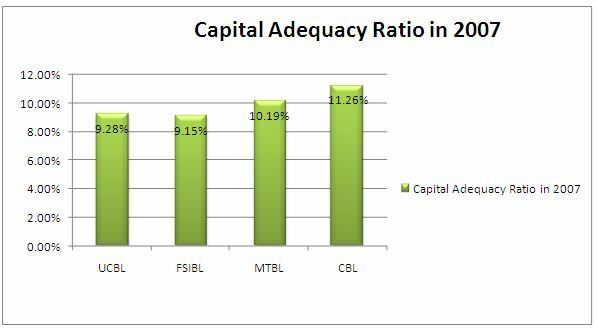 In 2010 FSIBL & MTBL Tier1 capital proportion was the highest at 7.92 and the UCBL Tier1 capital proportion is the lowest at 4.86%. Where was, CBL Tier1 was 6.84%. Table: 6 Tier2 capitals of selected Banks CAR. According to Bangladesh Bank guidelines all commercial banks are required to maintain their Tier2 capital maximum 5% of RWA. All banks maintain their Tier2 capital less than 4.5%. In 2007 CBL Tier2 capital proportion was the highest at 3.37% and the UCBL Tier2 capital proportion was the lowest at 1.41%. Whereas, FSIBL, MTBL Tier2 were 1.45% & 1.91%. In 2008 CBL Tier2 capital proportion was the highest at 3.46% and the MTBL Tier2 capital proportion was the lowest at 1.47%. Whereas, UCBL, FSIBL Tier2 were 1.90% & 1.86%. 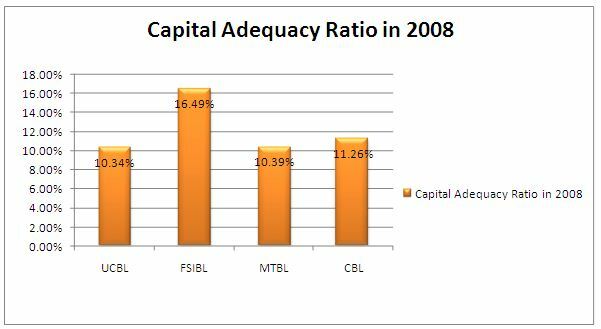 In 2009 CBL Tier2 capital proportion was the highest at 3.10% and the MTBL Tier2 capital proportion was the lowest at 1.55%. Whereas, UCBL, FSIBL Tier2 were 1.83% & 1.68%. In 2010 MTBL Tier2 capital proportion is the highest at 3.57% and the FSIBL Tier2 capital proportion was the lowest at 1.31%. Whereas, UCBL, CBL Tier2 were 1.44% & 3%. According to Bangladesh bank all commercial bank operate in Bangladesh had to maintain their CAR minimum 10%. The chart shows the four commercial banks CAR in 2007. According the chart MTBL & CBL maintain BB requirement. Whereas, MTBL CAR was 10.19% & CBL CAR was 12.61%. And UCBL & FSIBL position was the lower against risk arises from several risk factor. According to Bangladesh bank all commercial bank operate in Bangladesh had to maintain their CAR minimum 10%. The chart shows the four commercial banks CAR in 2008. According the chart all the banks maintain BB requirement. In 2008 FSIBL CAR was the highest at 16.49% and UCBL CAR was lowest at 10.34%. Whereas, the CBL CAR was the 11.01% and MTBL CAR was the 10.39%. Every bank should ensure training facilities for their employees about Basel. Bangladesh Bank should take responsibility to develop perfect software for calculation of RWA and CAR. Every bank should open their new department that wills only deals with Basel requirement. Finally, Basel committee should develop new and effective process for RWA calculation. Improve overall efficiency of banking and finance system. By requiring banks to determine capital adequacy based on the level of risk posed by specific business activities, banks will have to develop and use various risk based capital planning models. The business benefits a bank can derive from such risk based capital approaches extend beyond Basel II compliance. Because it links earnings to risks, risk based capital enables banks to identify business lines and business opportunities that create shareholder value. In addition to enabling banks to better identify and understand their risks, use of these approaches can help banks aggregate risk measures across all risk categories and business areas and ensure consistent allocation of capital to risks. A focus on risk based capital planning can help a bank optimize its incentive system to ensure compatibility of bank strategy and business-line management. Such a focus can also drive improvement in data collection and use and thus improve knowledge and awareness of risk and risk management throughout the organization. The challenge for banks will be to leverage the business benefits Basel II’s focus on risk based capital can help drive in their businesses. Leading institutions are seeking to monitor and understand their risks and capital usage, and then allocate and manage capital proactively. The development and implementation of a capital planning process – backed by the board and senior management and embraced by employees – is helping banks understand the capital implications of their risk-taking activities as well as helping them ensure their businesses are using capital efficiently.